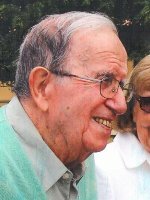 ALBANY – Anthony F. Russo, 95, of Albany, died Tuesday, May 8, 2012, at home, surrounded by his loving family. Anthony (Tony) was born in Albany, the son of the late Antonio and Carmela Aliberti Russo. A lifelong resident of Albany, he served in the Army Air Corps during World War II and was employed by the U.S. Postal Service until his retirement in 1975. He also was a former member of the Elks and a communicant of All Saints Catholic Church. In his retirement, he developed a previously hidden talent for art, creating many beautiful paintings. He also enjoyed cooking, serving and entertaining family and friends, but was never happier than when surrounded by his wife, children and, especially, his grandchildren. Anthony is survived by his beloved wife of 68 years, Philomena DeFlorio Russo; his children Mary Ann Donnaruma (Walter) of Delmar, and Anthony F. Russo, Jr. (Maria) of Clifton Park; and his grandchildren Julia and Jacqueline Donnaruma, Anthony F. Russo, III and Christopher R. Russo, M.D. Anthony was predeceased by his sister, Josephine Graziano of Hudson Falls, NY. A Mass of Christian Burial will be celebrated in All Saints Catholic Church, Homestead St., Albany on Saturday, May 12 at 9:00 AM. Interment will follow at St. Agnes Cemetery. Relatives and friends are invited to attend. There will be no calling hours. To leave a message of condolence for the family or send a sympathy card please visit www.HansFuneralHome.com. Click here to view Anthony’s resting place in St. Agnes Cemetery, Menands, NY. Our Condolences for your loss. Mr Russo was liked by all our staff. May he have peaceful and restful life further. Our special sympathies to Mrs.Russo. Dr.Patil and Staff. Specially Nina the nurse. From Tony’s Friends at the Italian American Community Center – “The Birthday Boys Club”….. We’ll miss you Tony! We are so incredibly sorry for your loss. We will be thinking about you and sending you warm loving vibes today.